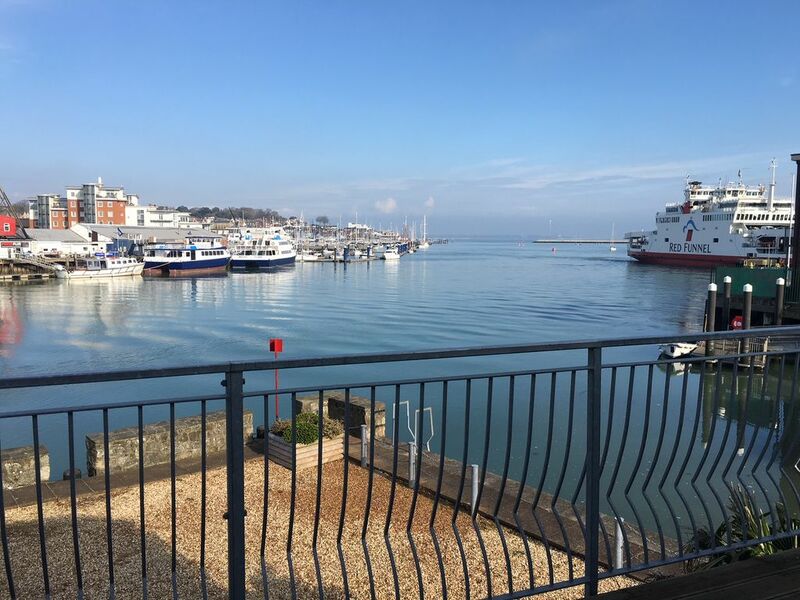 A delightful mews style cottage situated right on the waterfront with fabulous views across the river to Cowes Harbour providing an exciting ever changing scene of activity from boats and shipping. The living room and kitchen are upstairs and the bedrooms, (1 double and 1 small single) and bathroom are downstairs. There is a large wrap-around balcony upstairs, with a table and seating and overlooks the waterfront. Ideal for relaxing and watching the boating activity. Downstairs there are 2 bedrooms, . We live in Bedfordshire which is about as far away from the sea as you can get, so we go down to the Isle of Wight as much as we can. All the places we own have fantastic sea views, it's so important to us to have the sea close by. We like our visitors to be able to share these fantastic views too. The cottage is right on the waterfront. You can fish off the sea wall or just sit and relax on the balcony and watch the array of boats pass by. There are a selection of shops within 2 minutes of the cottage which is very handy. The Red Funnel ferry from Southampton is 2 minutes walk from the property. The cottage has an upside-down layout, so takes full advantage of the sea views from the living area upstairs. It has a large wrap-around balcony with patio furniture where you can sit outside and relax.. There is space for one car right outside the front door. Upstairs living room, 3 seater sofa, extending dining table and chairs, TV with Freeview. Open plan living area with patio doors to a decked balcony overlooking the waterfront. Modern kitchen upstairs, with electric hob, electric oven, washing machine, dishwasher, fridge and integrated microwave. Separate small freezer downstairs. There is a large wrap-around balcony with a table with seating. Notes on accommodation: The cottage is very close to the waterfront so this will have to be considered if bringing a child. There is very little barrier on the sea wall. Outside: There is a large balcony upstairs accessed from the living room. This has a patio bench with seats and a gas BBQ, and overlooks the waterfront. Cleaning / Towels / Linen / Maid service: Linen and towels are included. (Please bing your own beach towels) Clean linen and towels are provided weekly for stays of more than a week. The property is cleaned at each changeover. We thoroughly enjoyed our stay. The chain ferry was a bit noisy, but we got used to it and quite enjoyed watching all the comings and goings. The cottage is beautifully modern, clean and well equipped. The view from the lounge was amazing, you felt as if you could almost reach out and touch the boats. The weather wasn't up to sitting out on the veranda, but it must be fantastic on a sunny day. Very modern with all of the latest technology. Two TV's, BT WiFi, ultra modern kitchen. The single bed was fully adjustable (really). Plenty of cupboard space both upstairs and downstairs. There was a large veranda which boasted an almost 360 degree view of the East Cowes harbour. Although it was February, we were blessed with really good weather. Full central heating plus underfloor heating made it warm and comfortable. The only downside was that the stairs leading up to the main lounge were very steep and could be a safety hazard for children or the elderly alike. We did try to eat on the veranda, but the seagulls wanted to join our table and we soon retired back inside. But really a very relaxing and enjoyable stay. We would definitely recommend it, and would love to return in the future. Five stars all the way. Excellent. Even though the weather in February was cold, wet and dismal the view was spectacular. Good location. Isle of Wight varied and interesting. Would imagine the chain ferry could be a problem in the Summer. The choice between having the windows open in the heat and closed because of the noise would be a difficult one. The view from the living room is wonderful. 1.5 miles to Cowes beach (pebbled), or 8 miles to Ryde beach (sandy). 2 minutes walk from the Red Funnel Ferry Terminal in East Cowes which sails in from Southampton. There are regular bus departures from East Cowes to Ryde and Newport. The shops are just around the corner. Osbourne House is about a mile away on the way out of East Cowes. In East Cowes there are Waitrose, and Co-op supermarkets, There is also a chemist and various other small shops. The closest pub is 3 minutes walk away. There is an Indian Restaurant and a Chinese take away. The "Chain Ferry" is next door to Seymour Court and goes to Cowes where there are many shops, restaurants and pubs. Please note that the Chain Ferry operates from 05.30 until 00.15 and this may not be suitable for light sleepers. Booking Notes: Please contact the owner by phone or email. We are usually able to repspond within 24 hours. Deposit £50 (non-refundable) Bookings are from 3pm on arrival day and departure by 10am Balance payable 4 weeks before arrival Payment by BACs or cheque. All payments will be confirmed by email. Our availability calender is updated regularly. Bookings are Friday to Friday Changeover Day: Changeover day is Friday. Departure is by 10.00am and arrival after 15.00. Short breaks are considered. 3 nights - Fri-Mon: 4 nights - Mon-Thurs. Please contact the owner for prices.